It’s time to host my girlfriends for a summer get-together. 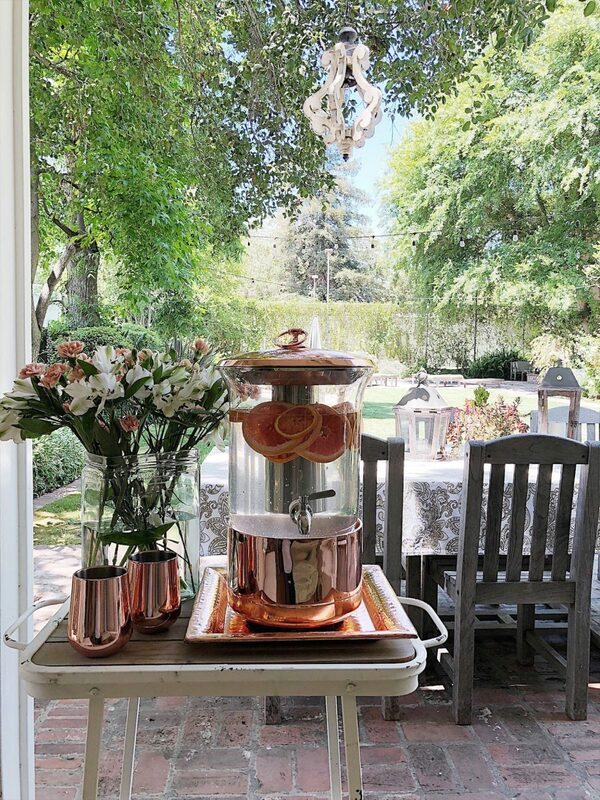 I am so excited to partner with Balsam Hill to create the perfect setting for a summer celebration. 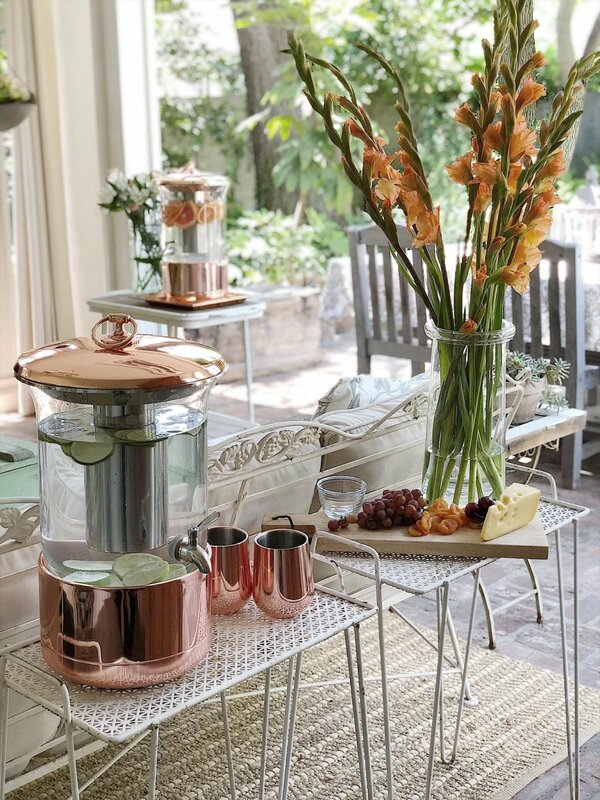 These copper items totally reformed our back patio and don’t be surprised if you see them out here well in to fall! OK, maybe even winter! Last week I spent some time out here adding more green to our back porch. 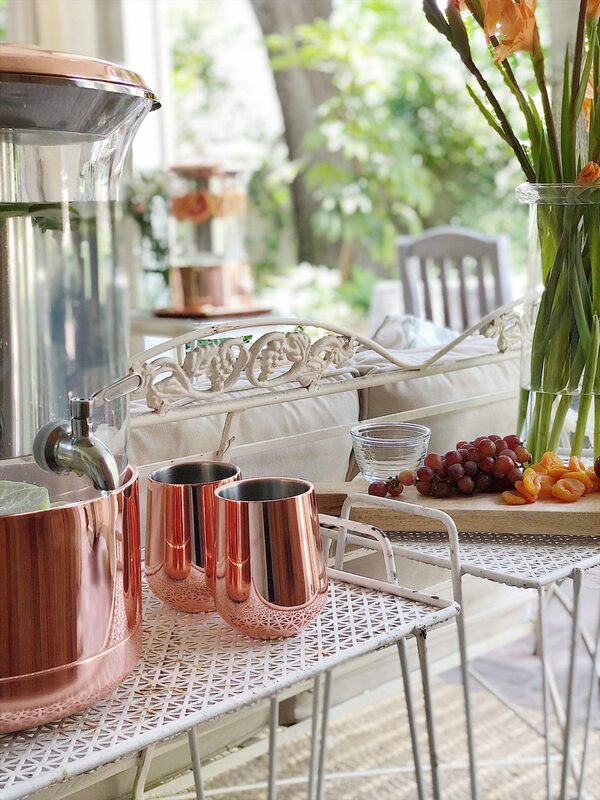 Now that I have added all of these gorgeous copper items, our outdoor living area is the ideal place for summer entertaining. 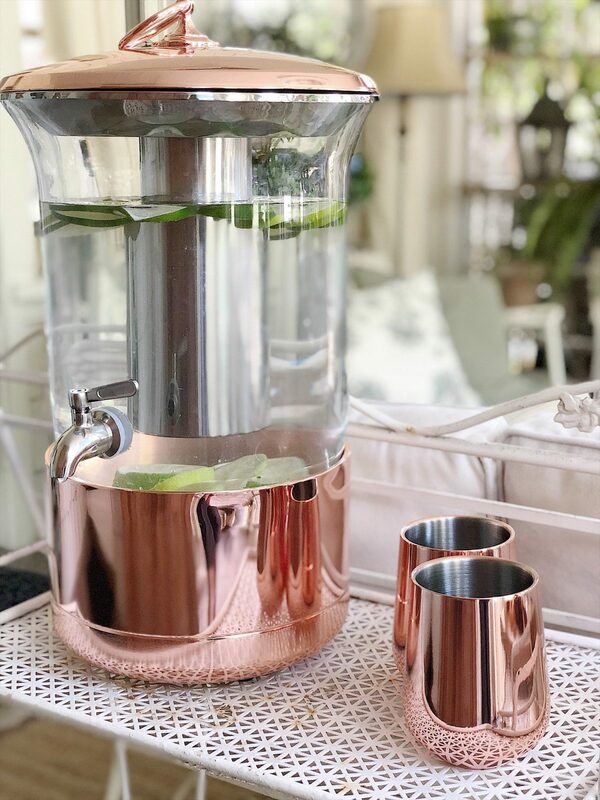 My favorite summer item from Balsam Hill is the Liberty Double-Walled Beverage Dispenser. You can put any beverage in here that you want. Water, lemonade, vodka lemonades … it’s up to you. I love that there is a removable ice chamber that keeps the beverage cool but doesn’t dilute it. It will keep drinks cool for up to 2 hours and can hold up to 2.5 gallons! It can also keep beverages hot if you fill the chamber with hot water. Plus, the dispenser spigot contains a silicone filter to remove pulp if needed. I love to put fruit in my water so that’s a great idea! I also got these Liberty Double-Walled Tumblers which are sold as a pair. They are really thick and guess why? The tumblers keep the temperature constant for up to 1 hour for hot drinks and 1.5 hours for cold beverages. How great is that? 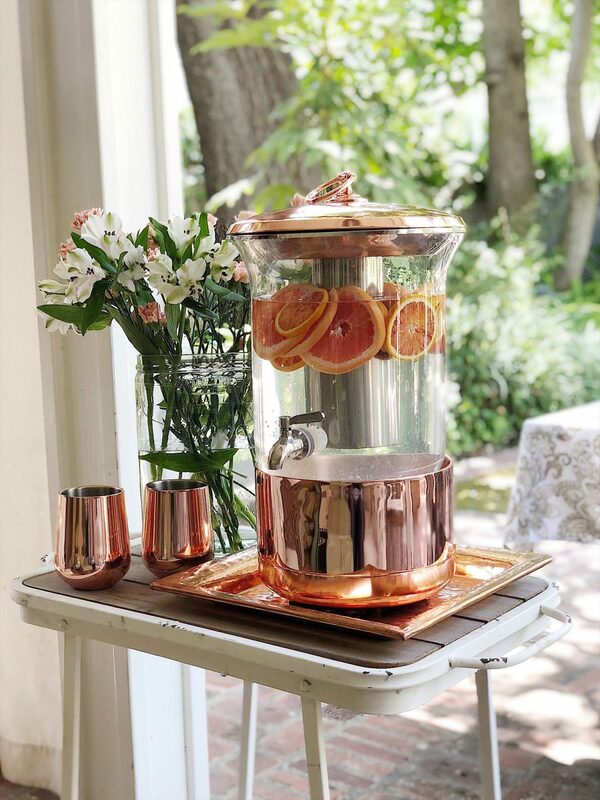 I filled this Beverage Dispenser with water and then added sliced grapefruit and blood oranges. I also added ice in the metal cylinder. How pretty is this for a late afternoon get together with girlfriends? I put together some light snacks consisting of cheese and fruit. I usually go way overboard with the food so this time I was smarter and just kept it light! I absolutely love this Liberty Double-Walled Beverage Tub. 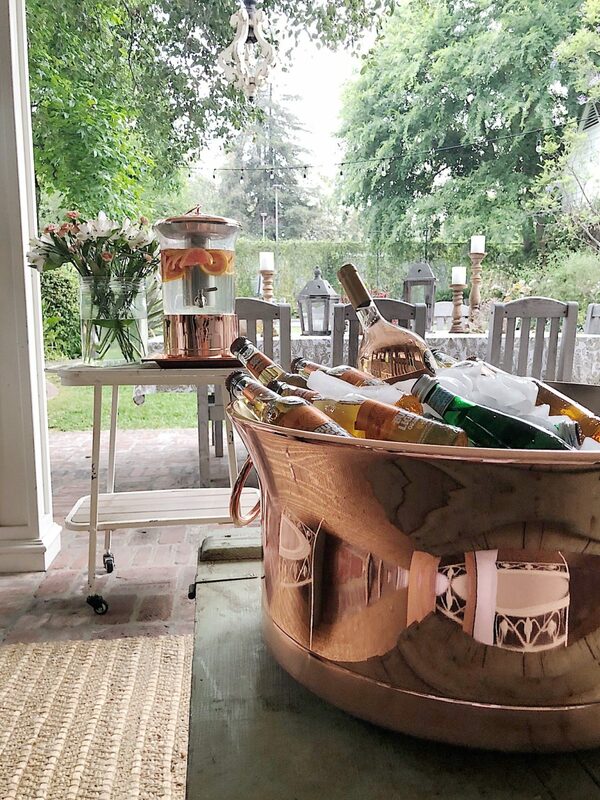 Made from double-walled stainless steel with electroplated coating, the tub holds up to 14 wine bottles or 20 beer bottles and keeps them cold for up to 5 hours. This is so much more than just a drink tub! And could it look any more beautiful? 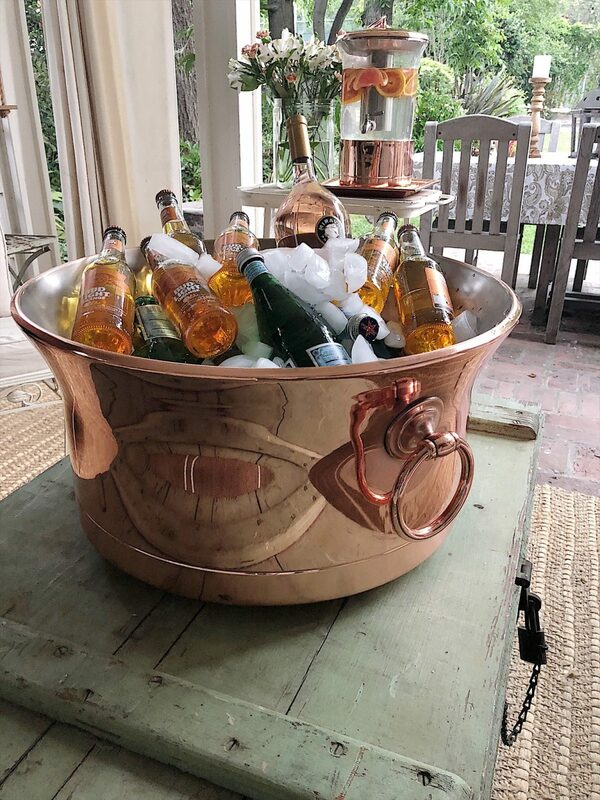 The copper beverage tub is just ideal for entertaining! 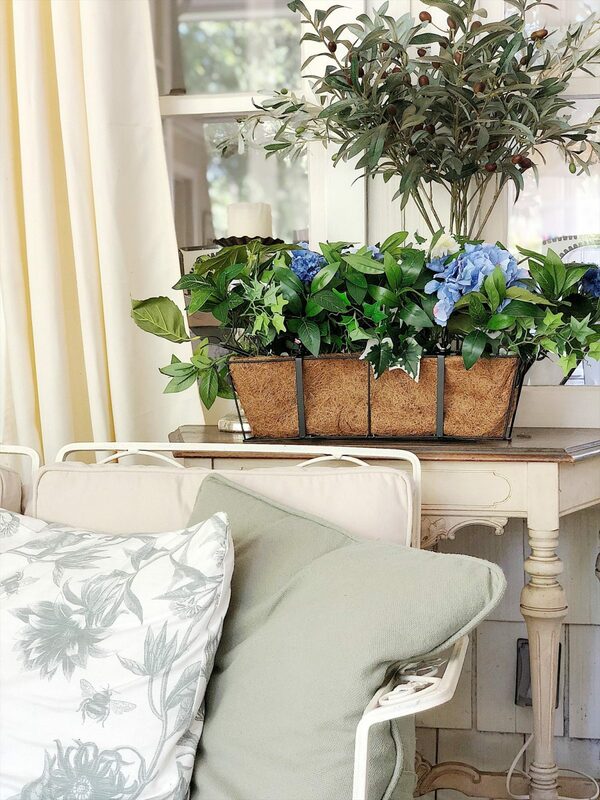 Balsam Hill also has some wonderful faux flower arrangements. I selected this Outdoor Blue Hydrangea Window Basket and look how great it looks on our porch! I love that the basket can either hang on a window sill or sit on top of a table. I filled the second Beverage Dispenser with fresh lime slices. Can I tell you how much I love how this looks on our porch? 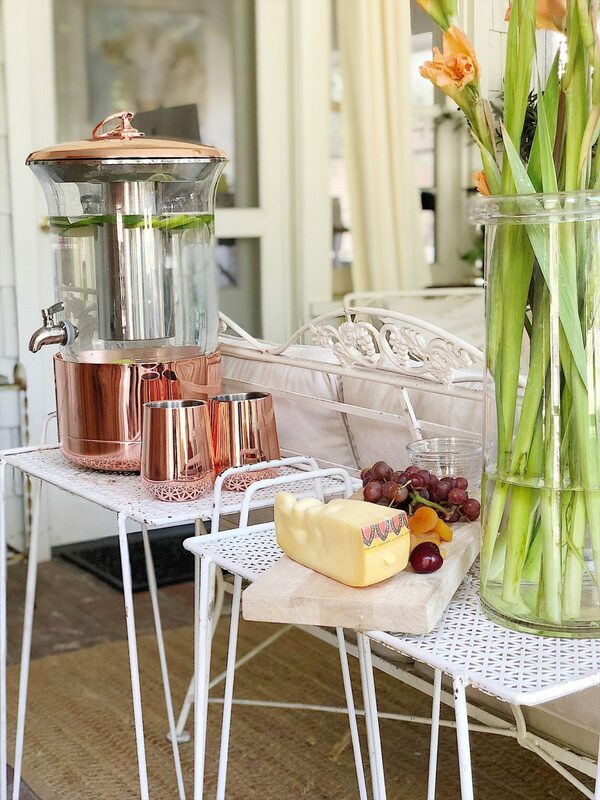 These beverage dispensers and beverage tub are as much decor as they are drink servers! I am so excited about how great our back porch looks! I can imagine refilling one of these beverage containers with water and fruit every morning throughout the summer. This is such a festive and beautiful addition to our outdoor area. I cannot wait for my girlfriends to arrive for a very fun summer celebration. This is a sponsored post written by me on behalf of Balsam Hill. The opinions and text are all mine. I love it all!! Great job Leslie!! Its all beautiful. I am new to your blog and instagram. I look forward to all of your posts. You do such a wonderful job.